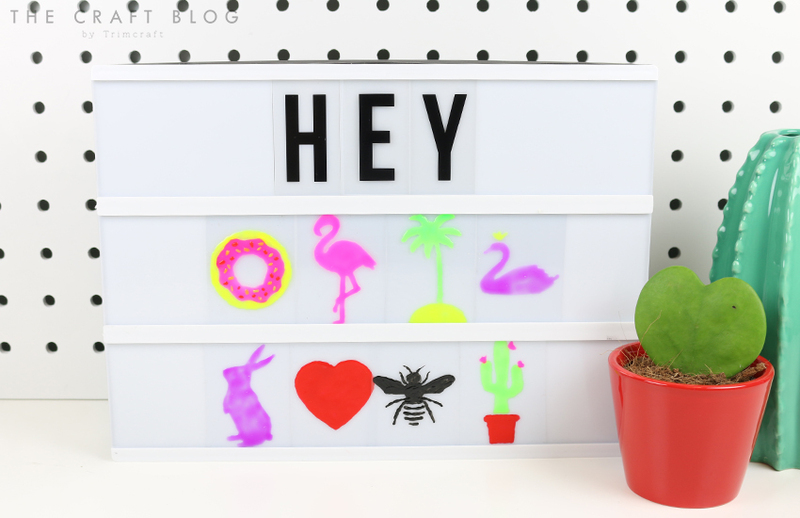 Lightboxes are popping up everywhere and they really are the PERFECT home décor piece to write a quirky phrase or to do a countdown to your favourite holiday. To give your lightbox a personal, vibrant feel, we have designed a selection of trendy symbols for you to use as many times as you like! (That doughnut is too cool for school!) Read on to find out how to create these colourful additions. 1. Firstly, print off your free template and place it behind an A4 piece of Dovecraft Acetate. Secure the two sheets together with Washi Tape. 2. Pick your chosen Dovecraft Glass Paint colour and following the template, fill in the shape. 3. If you’re adding different colours to your symbol and don’t want them to mix, we suggest letting one layer of glass paint dry and then adding your chosen colours on top. 4. Once your symbols are completely dry, carefully cut out each symbol following the guide line. Each symbol has been designed in a rectangle which will slide in with ease, in to your light box. 5. Now your symbols are ready to add to your light box alongside your chosen phrase! How cool are these lightbox symbols? You’ll definitely wow your friends with these fab designs when they visit your home! How will you use our free printable? We would love to see how you use these lightbox symbols so don’t forget to #trimcraft when uploading to social media and to share your makes in the inspiration area!